Is our 24/7, Crackberry, more-faster-now culture eating us alive – or setting us free? For everyone feeling trampled by the speed of life and business, author Vince Poscente reveals how to get ahead of the rush once and for all. 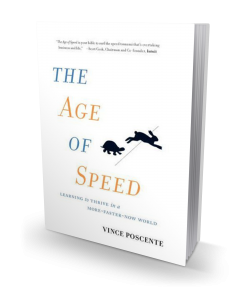 Unraveling the notion that in today’s world we need to slow down, Poscente illustrates why harnessing the power of speed is the ultimate solution for those seeking less stress, less busyness, and more balance. The Age of Speed shows this and other groundbreaking revelations at work with case studies drawn from renegade companies such as Netflix, Samsung, and Geico. At the core of Poscente’s argument for embracing speed is the claim that the continued acceleration of business and life is inevitable. If we cannot stop it, perhaps we should consider putting it to work for us. On a mass scale, we have developed a peculiar love-hate relationship with speed: though we want more, faster, now, we have adopted a mindset that speed is corrosive. In effect, we have decided that though we want speed, we do not like it. Poscente turns that perspective upside down and challenges readers not to resist acceleration, but instead turn the momentum of its inevitable rush to their advantage. 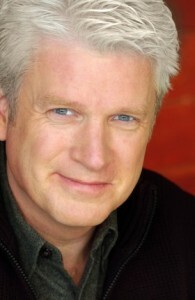 Vince Poscente, a business consultant and inductee into the Speaker Hall of Fame, used his unique perspective on speed to take him to the gold medal round of the Olympic speed skiing competition only four years after deciding to compete. He lives in Dallas, Texas.